European Council President Herman Van Rompuy passed the baton to Poland’s former prime minister Donald Tusk on Monday (1 December), during a handover ceremony in a packed Justus Lipsius building, seat of the ministerial meetings. Tusk listed his four ingredients for success, putting the emphasis on the crucial relationship between Europe and the United States, which is the ‘backbone’ of the community of democracies. “We are both responsible for the future of our relations. The year ahead will be crucial,” he added, hinting at the negotiations of the Transatlantic Trade and Investment partnership. Tusk was not shy in emphasising that politics has returned to Europe. “History is back. In such times we need leadership and political unity,” he added. In this context, protecting Europe’s fundamental values – solidarity, freedom and unity – becomes paramount against threats coming from both outside and inside the EU. “Not only there are Eurosceptics questioning the EU’s values, but we have also enemies,” he stressed. Tusk insisted that the EU be strong internationally, secure its borders, and protect those in the neighbourhood who share our values. Last but not least, he spoke about the need for “ruthless determination” to end the economic crisis. “It is our responsibility to complete a genuine economic and monetary union,” he added. 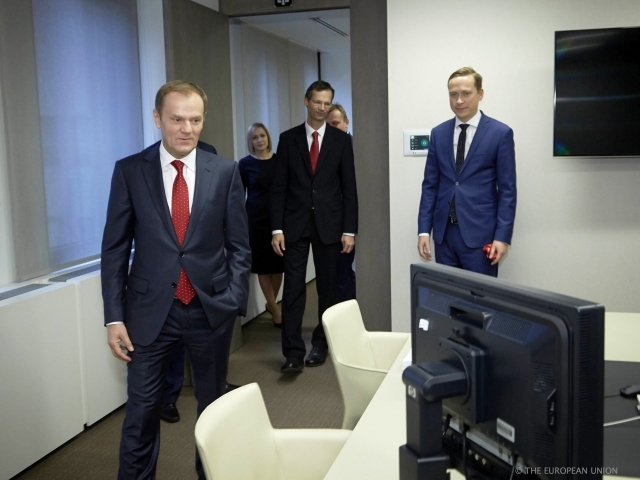 Tusk was chosen by EU leaders on 30 August to be the next President of the European Council. His main priorities over the next two and a half years, the length of the Council presidency, will be to get Europe out of the financial crisis, deal with the situation in Ukraine, and keep Britain in the EU. In appointing the experienced Polish prime minister, EU leaders ended the decade-long divide between ‘old and new member states’, experts said. Tusk has been a strong prime minister and achieved something most of his peers have failed to do, namely winning re-election at home. The Pole has shown he has a clear ability to forge compromises and a determination to push through necessary but unpopular policies. Tusk has considerable experience in eastern Europe, which should prove invaluable in light of the current conflict with Russia over Ukraine. He also has a good relationship with Angela Merkel, and most of his colleagues in the European Council, including Hollande and Cameron. A spat with Cameron over welfare migrants has been forgotten, as Tusk said he could not imagine a European Union without the UK. He will have a crucial role to play in charting a reform path that keeps the UK and others on board during the next five years. The new EU council chief will face his first test on the 18-19 December when the 28 EU leaders will discuss an agreement on a European investment fund aimed to revive jobs and growth by pulling private money into transport, energy and digital network projects, and debate economic reforms and fiscal discipline. EURACTIV Turkey: Tusk, AB Konseyi ba?kanl???n? devrald? 2. Tusk is not at the “helm” of the EU but the chairman of one of the EU Institutions, the European Council. Council presidency, will be to get Europe out of the financial crisis, deal with the situation in Ukraine, and keep Britain in the EU.